I am a Crossfitter. In fact, I would say I’m a Crossfit addict. When I go to Crossfit, I get a huge high, and when I miss a few days, I crave it. My ‘fitness personality’ has always been addictive though- I come from a long-distance running background, and nothing says ‘addict’ like logging 100km/week through a Canadian winter. My first experience with Crossfit was in January 2010, a year after my son was born. I was searching for something to make me feel strong and fit. I was already back into big-mileage running, but I felt that something was missing- my body wasn’t feeling ‘strong’, and a year after his birth I still felt beat-up and out-of-shape, despite all the running I was doing. 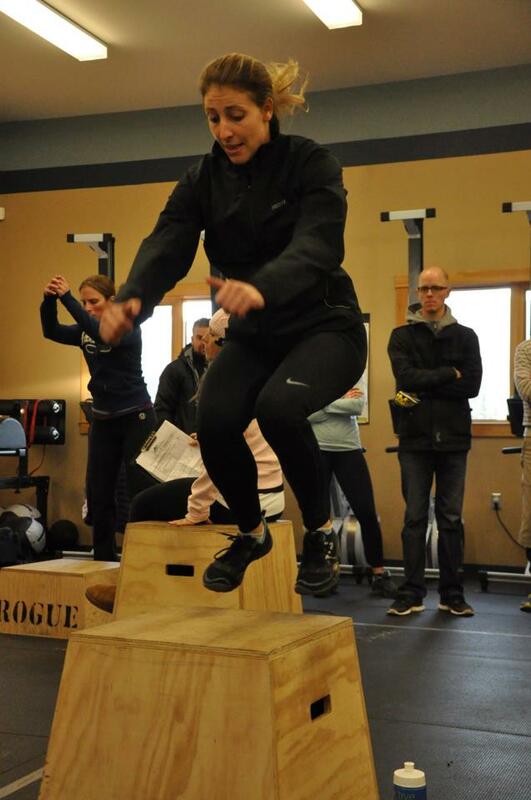 I contacted Crossfit Altitude, and owner Jen Morris told me to come by the next day to try a WOD (workout-of-the-day). I showed up at 6am on that dark January morning and nearly died with a rowing/power clean workout. I was hooked. From then on, I was a part of the ‘morning crew’. Four or five mornings a week, I was at the gym at 6am getting in my WOD, so I could rush home and take over baby-duty before my husband had to leave for work (as an aside, I would spend 10 minutes each morning excitedly telling him about the WOD and how great I felt- he soon jumped on the bandwagon and became an addict too. If you can’t beat ’em, join ’em.). It was always the same 5 or 6 people at the 6am WOD and they became a big reason that I loved it so much. I have since learned that the sense of community I felt early on at Altitude is a big part of Crossfit in general- Crossfitters are a huge support system for each other and Crossfit can be its own world unto itself. Go see a Crossfit competition sometime and you’ll see what I mean. Or better yet, head to California in July for the Crossfit Games, the Olympics of the Crossfit world. 1) Every sport has inherent risks, the sport of Crossfit is no different. Yes, I agree that deadlifts and power snatches can cause injury, but I also know that throwing a baseball, playing in a soccer game, or tackling in football can cause injury. Sport is risky. 2) The benefits of sport (usually) outweighs the risks. Cardiovascular health, muscular strength, bone density, body composition, and friendship, to name a few. Modifications can always be made for those Crossfit exercises deemed too risky for injury. 3) A Crossfit gym is only as good as it’s trainers. Just like track coaches, and rugby coaches, and basketball coaches- if you have a good coach/trainer, you will reap the benefits. And since Crossfit is gaining in popularity so quickly, and the ‘average-Joe-athlete’ is flocking to Crossfit gyms around the world, trainers need to be even more diligent on proper form, appropriate weights, and suitable programming. On the whole, I have found certified Crossfit trainers to be a knowledgeable, educated bunch, but as with all professions, there are some good, and some bad. 4) It is the responsibility of the participant to take their own health concerns into account. This is a pet peeve of mine regarding our healthcare system in general….I don’t agree with those people who allow others complete control of their health. Of course I agree that we need to look to healthcare professionals (and in this case, Crossfit trainers) as the ‘experts’, but we, as individuals, need to sit in the driver’s seat for our own health. Take charge! If something doesn’t feel right, if you feel you’re beyond your physical limits and deep into the potential-injury zone, speak up! It is your responsibility to be your best advocate. I’m sure I’ve stirred up some controversy here, especially amongst my colleagues. I’d be interested to hear your thoughts. And if you haven’t tried Crossfit, give it a go- I bet you’ll become an addict too! My sister-in-law, at a Crossfit Ramsay competition, as my brother watches on. My son Drew gets push-pressed at a local Crossfit competition. This entry was posted in Crossfit. Bookmark the permalink.